Info "The star of the circus has taken the stage! Please watch her skillful juggling!" 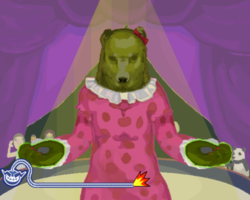 Bear Handed is one of Orbulon's Microgames in WarioWare: Smooth Moves. Its name is a pun on "barehanded". The player needs to juggle the objects with the controllers by controlling the bear's hands to throw the objects up. 1st level difficulty: One throw. 2nd level difficulty: Two throws. 3rd level difficulty: Three throws. This page was last edited on February 20, 2018, at 18:22.